AMLO’s campaign emphasized a populist message aimed successfully at convincing a bulk of the electorate that Mexico must change direction away from globalization-oriented policies to a nationalist economic agenda. But a case can be made that his election victory was largely determined by a “punishment vote” against the last few administrations rather than as a vote of confidence in AMLO. Either way, there is no doubt that the newly elected government has a unique opportunity to critically overhaul the Mexican political regime. For many of AMLO’s partisans, his arrival will bring to power a left-wing government poised to achieve social justice for all those who have been left behind. On the other hand, AMLO may represent a postmodern populist, for whom the old distinctions between Right and Left, and their preferred agendas, have little value. While seemingly astute enough to have read correctly the spirit of the times, AMLO’s future plans remain ambiguous. Since the end of the one-party regime headed by the Partido Revolucionario Institucional (PRI) in the year 2000, Mexico’s political landscape has been dominated by three major parties, with the PRI in the center, the Partido Acción Nacional (PAN) on the right, and the Partido de la Revolución Democrática (PRD) on the left. This time around was no exception. The main contenders were José Antonio Meade, representing the PRI and its coalition Todos por México (“Everyone for Mexico”), Ricardo Anaya from the PAN, with its coalition México al Frente (“Mexico Forward”), and López Obrador from the newly founded Movimiento de Renovación Nacional (morena), and its coalition Juntos Haremos Historia (“Together We Will Make History”). José Antonio Meade was mainly known as a competent administrator with a penchant for using technocratic language that he picked up during his years at Yale. The talk of the town was that he has never seen an econometric model he didn’t like. He could boast of considerable experience working in important cabinet positions—Hacienda (an immensely powerful department where economic policy is designed), Energy, and Foreign Relations—and he was seen by financial analysts and investors as the best qualified. On the downside, he never garnered the support of the PRI grass roots because he was not a party member. Mindful of the erosion of the PRI’s credibility, outgoing president Enrique Peña Nieto decided to choose Meade due to the sorry political situation of his government; as the elections approached fewer than three in ten Mexicans approved of his administration’s performance. Among the reasons for Peña Nieto’s remarkable unpopularity were widespread corruption, high levels of violence and insecurity, and the failure of his economic reforms to generate growth. The PAN’s Ricardo Anaya, the youngest of the three contenders, attempted to reach out to the young and the urban elites. But his campaign misread the state of mind of the Mexican people as a whole. From the start, he seemed aloof and showed little genuine interest in the population. In the language of Peter Thiel, he was offering bits when the Mexican people demanded atoms. He did not realize that the election was about the present rather than about the future. Anaya’s chances were further diminished when, as the campaigns kicked off, Peña Nieto’s administration waged an all-out attack linking him to a fishy real estate operation that he allegedly benefited from financially. Although the allegations were never proved, Anaya never recovered from it. AMLO, by contrast, has been a fixture of Mexican politics since 2000, when he became the first elected head of the government of Mexico City. He competed for the presidency in 2006 and 2012, garnering so much enthusiasm that he became the almost natural presidential candidate of the Left. AMLO came of age under the wing of the PRI, which governed Mexico from the time of Plutarco Elías Calles in the 1920s (although at first under a different party name). A bona fide priista, AMLO remained loyal to the party even after a group of high-profile members, unhappy at being pushed aside by the neoliberals, abandoned the party to found the social-democratic PRD. Later, persuaded by his peers from the Left and convinced that he would not have a chance to rise within the PRI, AMLO eventually joined the PRD. Once there he adopted a populist style undoubtedly tailored to garner the support of those left behind. No sooner had the 2012 election ended than, having established himself as the embodiment of the demand for justice for the downtrodden, AMLO started to travel across Mexico, visiting every single district in the country. As the image of the Peña administration was going south, AMLO’s popularity began to skyrocket. His most consequential decision was to found a new political organization, which he shrewdly named morena, as the Virgin of Guadalupe is known among many Catholic Mexicans. Now, at age 64, the time has finally come for him to take the wheel of the Mexican government. The outcome exceeded the expectations of AMLO and his newly founded party. Polls on the eve of the election indicated that he would win by a margin of around 15 percentage points, but he wound up winning by almost 30 points, an outstanding performance by all accounts. Well behind was Anaya, winding up in second place with 22.3 percent, and the PRI, in what was the worst performance in its history, collecting a mere 16.4 percent. The biggest loser by any measure was the PRI, for its number of congressmen shrank dramatically, and perhaps more important, it will now be entitled to only a tiny portion of the resources it previously received from the federal electoral authority when it was the largest party. Moreover, the PRI will now control only twelve governorships and no longer holds the majority in many state legislatures. The catastrophe was so great that the president of the PRI, Claudia Ruiz Massieu, suggested that it would be better for the party to change its name. As for the second-largest party in Mexico, the PAN, its influence has also been greatly diminished. Not only has its presidential candidate suffered a humiliating defeat, but the party was left deeply divided and weakened as a result. Even if they wished to, the PRI and PAN combined could not pose a real challenge to morena, at least in the short term. AMLO was victorious across the board. His victory has been described by many pundits as a political tsunami. His voters included the wealthy and the poor, the highly educated and those without schooling, the old and the young, and rural and urban people alike. How did this happen? One commonly heard explanation is that, unlike in his previous campaigns, this time public relations wizards took charge of AMLO’s messaging and skillfully used social media. Another reason has to do with the fact that AMLO has been campaigning since 2006, becoming Mexico’s best-known politician. But the most important reason is that, whereas in 2006 and 2012 voters might have seen the election as a referendum on AMLO, in 2018 voters saw the election as a referendum on the PRI. A case can certainly be made that AMLO’s victory was not of his own making. The Mexican ancien régime seems to be entering an advanced stage of decay. Peña Nieto’s administration was marred by extraordinary levels of self-dealing, permitting or even promoting a series of governors who engaged in wholesale corruption, remarkable even by the PRI’s historical standards. Furthermore, although President Peña Nieto succeeded early in his administration in garnering support for his “structural reforms”—supposedly necessary to get Mexico on track to broad-based economic prosperity—he was in the end unable to close the deal. Had these reforms succeeded, private investment in the energy sector would likely have increased oil production to levels reminiscent of times past, when Mexico was one of the world leaders in energy exports. But these hopes were never realized. Moreover, Peña Nieto’s administration unsuccessfully undertook a modernization of the education system, attempting to introduce more meritocratic evaluation, with the goal of reducing the power of the formidable Mexican teachers’ union. AMLO, however, rejected such a reform on the grounds that its intention was punitive rather than rehabilitative. In the end, Peña Nieto failed to convince most Mexicans that his education reform would bring Mexican children into the twenty-first century. Peña Nieto’s attempts to grapple with the challenges posed by drug-trafficking cartels also failed. This problem can be traced back to the strategy devised by President Felipe Calderón, who, after his election in 2006, decided to attack head-on the power of the cartels that had robbed the Mexican state of its monopoly on legitimate violence in some areas of its territory. The strategy backfired, giving rise to high levels of violence across northern and central Mexico as the cartels dug in and reconstituted themselves. Notwithstanding Calderón’s obviously flawed policy for confronting the drug traffickers, Peña Nieto failed to change gears and doubled down on Calderón’s brutal yet ineffective strategy. As bodies piled up and thousands of victims began to raise their voices, it became apparent that Peña Nieto presided over one of the bloodiest eras in Mexican history since the Revolution. As if that were not enough, the scandal of Ayotzinapa also took place on Peña Nieto’s watch. Under circumstances never entirely explained, forty-three students simply disappeared from the face of the earth in the state of Guerrero. The issue remained in the headlines and became a topic of international concern for years. Taken together, the highly visible failures of Peña Nieto and his team should not be overlooked as an explanation of the election outcome. After a dramatic triumph, morena will have an overwhelming capacity to carry out its political project. Although a few seats shy of the congressional supermajority needed to change the constitution, morena only needs the support of one party to undertake a far-reaching overhaul of Mexican law. In a Machiavellian maneuver, AMLO, while president-elect, signaled to morena’s congressmen to allow a senator-elect from the Green Party (formerly staunch allies of the PRI) to finish his term as governor of the state of Chiapas in return for the support of a handful Green Party congressmen. This move gives morena the supermajority needed to change the constitution. But serious questions concerning the cogency and intelligibility of morena’s project remain. In some sense, AMLO’s dilemma is well known and seems reminiscent of Trump’s. An authentic outsider, morena is a collection of disparate groups encompassing former PRI and PAN members, Hugo Chávez–loving socialists, conservative Catholics, and modern entrepreneurs with almost nothing in common except their ambition and loyalty to the strongman. The lack of a clear-cut project for overhauling the government is perhaps the greatest challenge facing the new administration. From the outset, AMLO will confront two main problems: one political and one economic. With regard to politics, it would be wrong to argue that Mexico is suffering from political gridlock; if anything, it is the opposite. Congress has passed many laws, although more than a few of them wound up making little sense. Moreover, according to Integralia, a think tank, Mexico’s Congress has more committees than any other in the world, a kind of legislative hyper-bureaucratization. Streamlining executive and legislative government seems sensible in the face of such hypertrophy, and that may be AMLO’s intention. With respect to economics, despite the firm consensus among Mexican elites on the desirability of globalization, AMLO’s triumph shows that many Mexicans count themselves among its discontents. Although Mexican public officials peppered their speeches with flashy language boasting that no other country has signed as many trade agreements as Mexico, the public benefits of these agreements are doubtful. When it comes to economic performance, Mexico’s results, while not a wholesale failure, by all accounts have been mediocre. Since nafta was signed in 1992, the country has not achieved more than 3 percent annual economic growth. Steeped in neoliberal economics, every single administration since the arrival of Carlos Salinas de Gortari in 1988 has supported the “Washington consensus” that recommends integration into the global economy, dependency on international investment, and conformity to the doctrine of the free market. And although the application of these policies has ensured low inflation rates and fiscal discipline, prosperity has not reached most of the population. Adding insult to injury, the most affluent Mexicans are perceived to have taken advantage of a series of loopholes and self-serving policies to get ahead at the expense of the underdogs. For many, Mexico seems to validate Gore Vidal’s assertion that there are societies which offer the free market to the poor and socialism to the wealthy. Mexico’s political troubles cannot be separated from its history. Unlike the United States, a country that has had organized, uninterrupted federal elections since 1788, even during the Civil War, Mexico for most of its history has not enjoyed political stability. The nineteenth century in Mexico was a Hobbesian spectacle in which the two groups struggling for power—liberals and conservatives—seemed to be practicing politics in a state of nature. 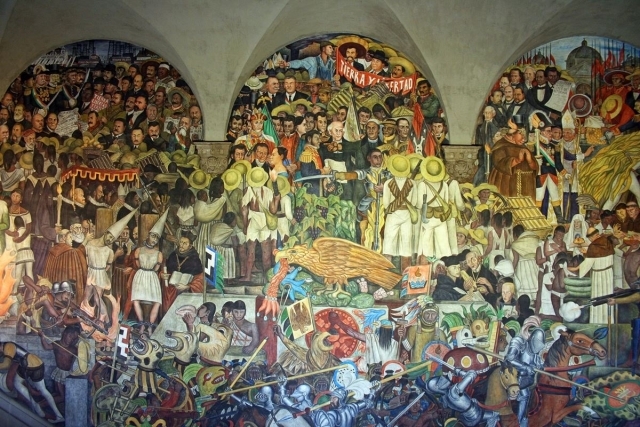 According to the historian Enrique Krauze, Mexico has only enjoyed two liberal democratic moments: the brief period when Francisco Madero governed (1911–13), and the present day. Liberal democracy is indeed an anomaly in Mexico’s modern political history. Instead, in postrevolutionary Mexico, something akin to political stability emerged from two different foci—the Constitution of 1917 and the uniparty system. On the other hand, the PRI was born at a time when nationalist parties with a monopolizing agenda had become fashionable in Europe and elsewhere. Although the PRI was not fascist by any stretch of the imagination, its creation was inspired by the same motives as its cousins in Europe. Nevertheless, it could also be argued that Mexico’s PRI bears a closer resemblance to a different political landscape: corruption and clientelism under the PRI is perhaps more reminiscent of how politics played out in eighteenth-century Britain under Whig leadership. In the case of Mexico, the party was meant to represent the state and the Mexican society at large. It was not just a party, but a way of life. Despite fostering a merely simulated democracy and promoting political control over the population, the PRI did contribute significantly to the political stability of the country. As the political scientist Rafael Segovia has argued, the PRI saved Mexico from two worse destinies—Marxist-inspired, guerrilla-motivated military coups and right-wing military dictatorships, fashionable during most of the twentieth century in Latin America. Despite its achievements, however, the era of the PRI seems to have finally reached its end. The new political hegemon in Mexico is now AMLO’s party, morena, and it has a great opportunity to turn Mexico around. Like Trump, AMLO does not acknowledge intellectual parents or forerunners. He does, however, see himself as standing on the shoulders of political giants. His heroes are three Mexican statesmen who played critical roles in the construction of Mexico: Benito Juárez, Francisco Madero, and Lázaro Cárdenas. An amateur historian of Mexico, AMLO may have a sober vision of the current moment. He has been careful not to alienate private corporations, foreign investors, and entrepreneurs. His first message as president-elect was meant to calm financial markets. Keenly aware of the importance Mexicans attach to independent institutions such as the Banco de México (Mexico’s central bank), the INE (the federal electoral authority), and others, AMLO has cautiously abstained from taking them on. Nevertheless, like Andrew Jackson, AMLO despises permanent officeholders. What Trump calls the deep state, AMLO describes as “la mafia del poder,” an elite group that allegedly exploits the masses for its own benefit. But AMLO’s rhetoric in his struggle against the Mexican bureaucracy is different than Trump’s. AMLO’s singular political merchandise is honesty. If Trump boasts about his wealth, AMLO broadcasts his humility. Whereas Trump recycled a Reagan slogan (“Make America Great Again”), refashioning it in the gigantist aesthetic of an ambitious real estate developer, AMLO’s idea of Mexico’s “fourth transformation” takes its bearings from something like a Whiggish interpretation of history. (1) Fostering economic nationalism by moving away from the focus on Mexico’s links to the global economy. On this topic, Trump and AMLO’s concerns converge, and a new North American free trade agreement has (however modestly) reflected a new nationalistic consensus in each country. This approach also indicates that the newly elected Mexican administration will undertake an energy policy bent on reversing the previous administration’s strategy of opening up the oil industry to foreign private investment. (2) A focus on the moral regeneration of the Mexican polity through calls to overcome an age-old culture of corruption. But while AMLO was elected as the model of an honest man, his prescriptions to rid his country from the shackles of lawlessness are nothing but ambiguous. Hoping for a clean transfer of power, AMLO decided not to prosecute Peña Nieto administration officials and governors for alleged acts of corruption, with the Odebrecht case being the most prominent. (3) An overhaul of the federal bureaucracy intent on reducing costs, while attempting to relocate most of the ministries from Mexico City to the several states. This is an unprecedented move in the history of the nation, which, if successful, would fundamentally modify the centralized makeup of the country. AMLO is also aiming to reduce the salaries of high-ranking and middle-ranking public officials on the grounds that they are quickly corrupted and maintain a high standard of living which is perceived as an affront to hardworking Mexicans earning low wages. (4) A massive transfer of resources (about five hundred billion pesos) to the downtrodden, especially to youth and the elderly. This is to be accomplished through a system of subsidies and entitlements supposedly funded by shifting resources away from the corrupt and wealthy political class. Further state investment would be directed toward a system of oil refineries and the construction of a transisthmian canal in southeastern Mexico. Whatever the fourth transformation turns out to be, however, it will not embrace a European-style welfare state that plays a key role in the economy. AMLO has not proposed any plan to accomplish this, or to systematically introduce more progressive taxation and redistribution. Insofar as one could pin down AMLO’s policies, they do not lay out a social democratic agenda. But neither does his refusal to raise taxes mean that he is engaging in supply-side economics. AMLO is not Reagan. How then can his proposals be described? André Breton called Mexico the chosen land of surrealism. And the end of the technocratic political regime may be followed by the renaissance of a baroque political culture: a communitarian fervor pushed forward by a voluntaristic leader with no convincing project as to where to go. The 2018 presidential election might be the first in the history of modern Mexico in which the chief divide was not that between the Right and the Left but that between the establishment and those who rejected it. Another important difference between the 2018 election and the two prior elections when AMLO was on the ballot (2006 and 2012) is the international context. The most recent Mexican election is part of a wave of populist political movements all over the world. What Victor Orban calls “illiberal democracy” and Steve Bannon calls “economic nationalism” has taken the West by storm. Many other “nationalist” or “populist” leaders have come on the scene as well—Vladimir Putin of Russia, Jarosław Kaczyński of Poland, Rodrigo Duterte of the Philippines, Recep Tayyip Erdogan of Turkey, Matteo Salvini of Italy, and Jair Bolsonaro of Brazil. Meanwhile, the Western world as a whole seems to be going through one of its periodic phases of self-criticism. What people are taking issue with is the Panglossian confidence of the Davos consensus, the belief in the almost magical qualities of technology and economic liberalism (nowadays jointly exemplified by the so-called fourth industrial revolution) to transform or replace traditional political action and sources of meaning. This consensus seems to have reached a point of diminishing returns. Steven Pinker’s naïve Enlightenment does not seem to touch the man and woman on the street. This does not mean that these new movements are not playing with fire, and they could certainly lead to a dead end. The lessons of radical politics in the twentieth century should never be forgotten. The current dilemma might be described thus: can classical liberal democracy be compatible with the means and ends of the new populist movement, whether of the Right or Left? Whatever the answer may be, Mexican politics can be said to be in sync with the times. Just recently, Steve Bannon, in an interview with the Economist, named López Obrador as part of the populist movement he calls economic nationalism. Although AMLO’s view of the world may be much different than Bannon’s, he intuitively understands the importance of Mexico’s turn to more nationalistic policies and away from globalization. Tatiana Clouthier, AMLO’s charismatic spokeswoman during the campaign, once tweeted that Mexicans should start buying Mexican products rather than foreign ones. This reminds us of “Make America Great Again.” AMLO’s fourth transformation can be interpreted as a moment of Mexican aloofness from the world. What Octavio Paz identified in his Labyrinth of Solitude as the temptation of the Mexicans to conceal themselves from the world coincides with their northern neighbor’s moment of turning inward. If asked, AMLO would certainly deny any resemblance between morena and right-wing populist movements. He and his followers would rather be seen as cousins of parties such as Syriza and Podemos in Europe or the movement headed by Bernie Sanders in the United States. Long-time defenders of AMLO have no doubt that he is a man of the Left. And they are certainly correct up to a point, for AMLO has never concealed his sympathy for the Cuban Revolution and the regime that has governed the island since 1959. But outside this important point it is difficult to pin him down as a full-fledged leftist. The joke may be on those who see AMLO as a left-winger; they may discover progressively the extent to which he is another clever postmodern populist, who finds insignificant the distinction between Left and Right. While the Left in Mexico is generally secular, AMLO is never shy about his Protestant faith. Although he is not a Catholic, he appears to understand the political importance of Mexican Catholic fervor. One of morena’s allies is the Partido Encuentro Social (Social Encounter Party, or PES), a Christian conservative party, which opposes gay marriage and abortion (the main causes of the cultural Left in Mexico, as in the United States) and which will be influential in several committees in Congress. While the Left in Mexico is in the habit of displaying its idealism, AMLO has demonstrated that he can be cynically pragmatic. Days after the election, he sent a letter to Trump in which he told him that he saw important similarities in their respective styles of leadership. AMLO might not be wrong about that. There truly are significant affinities between Trump and AMLO. They are not much interested in what happens in the world at large, and both think their respective countries are in need of rejuvenation. As though Rousseau were whispering in their ears, their rhetoric stresses the importance of the sovereignty of the people. Similarly, AMLO, like Trump, has engaged in fights against the media, which both leaders regard as partisan and interested in frustrating their respective projects. While Trump calls the mainstream media “fake,” AMLO calls the Mexican press “prensa fifi,” an epithet signifying the elite social class whose interests the press allegedly serves. One of the more striking resemblances between AMLO and Trump is their unusual willingness to use the word “love” in their political rhetoric, especially when describing their relationship with their followers. Allan Bloom once called attention to the absence of the term “love” in the American Constitution and the Declaration of Independence. He meant that the contractarian liberalism of Hobbes and Locke relegates love to the private sphere. Indeed, the return of eros to the public sphere might be the main feature of the new populisms, regardless of whether they are from the Right or the Left. In the same spirit, Francis Fukuyama in his most recent book, Identity, understands this new populist revival as the mixture of two forms of thumos: isothumia and megalothumia. The desire for a powerful, charismatic leader coincides with the aspirations of peoples in various parts of the world. But it is not just Mexico and the United States that are adopting a more inward-looking posture; the entire world seems to have renounced utopian universalism. Not only is China’s Maoism no longer a political and economic ideal, it does not even work as a slogan. It has truly been thrown into the dustbin of history. But Deng Xiaoping did not replace ideological Communism with full-fledged liberalism. Closing China off to modern ideological options, he and his heirs have sought to recover Confucianism for the twentyfirst century. But so far neo-Confucianism, outside of Asia at least, has not become an exportable model. Likewise, Russian models are for Russian consumption and not intended as a universal utopia. Marxism-Leninism is an option only if one is enamored of lost causes. Putinism today can aptly be described as authoritarianism with a nonhuman face. Alexander Dugin’s version of Eurasianism, a geopolitical shift away from Western-inspired globalization, is for Russians only. At the same time, Nietzsche’s death of God has rendered almost impossible an all-out return to the religious orthodoxy of yesteryear. Meanwhile, the cosmopolitan, constitutional European project supported by a Habermasian mindset is being attacked by conservative Brexit supporters, Orban-like “illiberal democrats,” and leftists like Syriza. The postwar European project was never meant to cover the earth. Its primary export product, the welfare state, was seen as a second-best option from Latin America to Asia, and not as the realization of a secular paradise. Latin America has not yet found a viable road to fulfill the three-pronged promises of modernity: liberté, égalité, and fraternité. Torn between the Scylla of a bankrupted neo-Bolivarian dream that was really a nightmare, and the Charybdis of Mauricio Macri’s irresponsible neoliberal policies, Latin America seems lost. Without a model to turn to for inspiration, Mexico seems to be on the verge of forging its own path out of full-fledged liberalism. AMLO’s intellectual journey has taken place as though the world outside Mexican borders does not exist, yet he seems to be a man for his age. AMLO announced his cabinet many months before the election. Although he made some changes, he retained most of the original members. The one who, at the moment, seems poised to become AMLO’s closest political adviser is the former mayor of Mexico City, and currently minister of foreign relations, Marcelo Ebrard. He might play Cardinal Richelieu to AMLO’s Louis XIII. Ebrard met a few times with President Trump when AMLO was president-elect and will dominate not only the international agenda but also national politics as a result of his alliance with the leader of the Chamber of Deputies, Mario Delgado. But Ebrard’s main challenge will be to manage Mexico’s relations with the United States. In 1984, the American journalist Alan Riding wrote Distant Neighbors, a shrewd account of the state of affairs in U.S.-Mexico bilateral relations. The book became a best seller in Mexico and was understood as a call for a new diplomacy focused on getting the two countries closer to each other. This outcome coincided with the neoliberal dream, and was the anticipated result of globalization. With AMLO and Trump in power, that dream now seems shattered. But, paradoxically, it may be the shared rejection of a self-forgetting globalism that allows for a new diplomacy grounded on the well-being of each country’s own people. Two “postmodern-populist” leaders, who may have more in common than either would be willing to admit, will decide the outcome. I recently visited Comala, the town the Mexican writer Juan Rulfo made famous in his novel Pedro Páramo. Not far away from the town proper, further into the wild, there is a place called la zona mágica (“the magical area”). At some point on the highway, an optical illusion makes drivers believe they are going uphill when in fact they are driving down. Many voters around the world believe they have experienced the same phenomenon in the politics of the last few decades; others believe we are just entering such a zone now. We can only hope that AMLO will avoid the dead-end road of the demagogues, who sell only illusions, and that he will instead offer a solid path towards prosperity for all Mexicans. 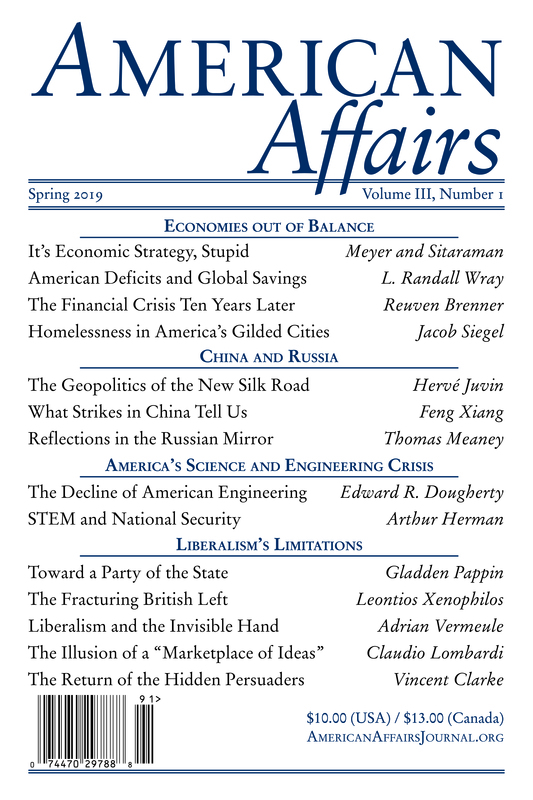 This article originally appeared in American Affairs Volume II, Number 4 (Winter 2018): 3–16.